As I mentioned in a post ten years ago, my folk-rock band, The Morning, based in New Haven, jumped at the chance to be on the bill with the hottest (and arguably the first) “supergroup” of its day, featuring the most critically acclaimed rock guitarist in the world, Eric “Slowhand” Clapton. But what I dimly grasped that night became a seminal insight later—and a core pillar of my business consulting today. I witnessed first hand what had been widely reported in the pop music press. Cream was a band riven by conflict. But, more importantly, that dissension was part of what fueled their greatness—as is the case with many creative teams. That Wednesday evening, when I strolled into a sold-out Woolsey Hall on the Yale campus, I was looking forward to meeting Eric Clapton (aka “God”), bassist and vocalist Jack Bruce, and drummer Ginger Baker—all musical idols of mine. But after my band performed its opening set, Cream and their road manager arrived, sullenly walked into our shared dressing room, and promptly kicked us out. (They had urgent business to attend to, which I wryly reported in that previous post). The vibes were heavy, to say the least. These celebrities were decidedly non-communicative with each other and seemed to be living in different worlds—which was evident on and off the stage. And yet, for the time, it worked! Cream exhibited two kinds of classic tension, common to many small business teams: creative conflict and relational conflict. Creative conflict occurs when people bring different viewpoints to a task or job given their differing backgrounds, expertise, etc. This is all to the good. As I’ve pointed out many times on these cyber-pages (here, here, and here) individuals with divergent backgrounds, orientations, and skill sets can unleash “creative abrasion”—in the words of Nissan Design International founder Jerry Hirshberg. This is the friction between strong individuals with opposing views which can generate "creative sparks" that yield innovative ideas and sometimes breakthrough products and services. If properly harnessed, this has given teams like Apple’s original Macintosh team (or iPod team or iPhone team) the magic mojo to produce something previously unimagined. Relational conflict occurs when communication breaks down, hostility reigns, and team members have difficulty conversing with each other. The conflict becomes personal. This is usually unproductive, although there have been teams (and bands) able to manage this over the long term, because they were committed to doing so. The three members of Cream shared some similarities. They were all supremely talented white male British musicians from troubled backgrounds, but they displayed many differences which defined their creative conflict, especially as time went on. Jack Bruce, a forceful bulldog of a fellow with a background in jazz and a muscular approach to his instrument, liked to crank up his bass and use a stack of Marshall amplifiers to make his musical statement. This was a problem for Ginger Baker, a rather cantankerous oddball with a penchant for African rhythms, who assailed his drums with dazzling originality and wanted to be heard doing so. It also forced Eric Clapton, a mild-mannered blues artist with a more accommodating disposition, to reluctantly amass his own arsenal of Marshalls to keep up with Bruce’s bellowing bass. It was an escalating high-decibel arms race that took no prisoners and taxed everyone’s (including the audience’s) tympanic membranes. Yet they were able to excel because their instrumental virtuosity was so stunning (years ahead of everyone except Jimi Hendrix) and their collaborative improvisation was so ground-breaking. The artistic competition within the band pushed them to new heights, ushering in a different kind of rock music, which eventually—for better or worse—morphed into what became known as heavy metal. No one since has played it better. But what tipped the scale and shortened the lifespan of this power trio was relational conflict. Their differences became personal and damaged their friendship. There was no one to successfully mediate the daily grind of that conflict (though Clapton tried to) which was played out in close quarters on a nearly daily basis for two years. 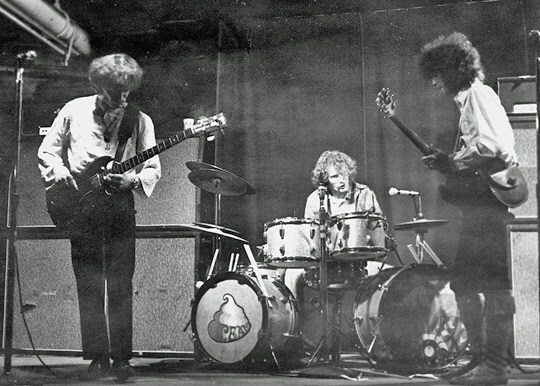 Baker and Bruce had quarreled frequently in their previous band together, The Graham Bond Organization, but it was hoped that the success of Cream would encourage better behavior. It did at first, then it didn't. We also can't overlook that their reliance on "substances" (such as methamphetamine) to keep themselves going night after night was, shall we say, an ill-advised career decision. (As a business consultant I've never found that shooting speed is conducive for reflective team-building.) A subject for another occasion. All in all, what summed up the band best was the title of one Cream song, co-written by Eric Clapton: "Strange Brew." But for one glorious evening, on April 10, 1968, I saw creative abrasion in action and it was a beautiful thing. Footnote: The Cream photo at the top was not from their Woolsey Hall appearance, but from an earlier gig at the Psychedelic Supermarket in Boston. The photo is courtesy of my late friend, Ken Melville—once a frequent commentator on this blog, whose blues band (Catharsis) opened for Cream for six days in September 1967. Ken used to regale me with stories of Bruce and Baker bickering with each other backstage while Clapton retreated to his sketchpad to do some serious doodling, as would be expected of an art school drop-out. Differences make things interesting. Anger doesn't. If there's respect, I can debate with someone all day long and part (or not part) friends, and that'll be a better long-term relationship, personal or professional, because of our respectful differences. Anyone hoping these guys would stick it out for the fame or money was missing the boat. Their musical differences probably would have lasted ages, but any partially sane person will get tired of the anger after while. Or maybe I'm thinking about my own past, eh? I'm always amazed at the bands that didn't get along all that well, but kept it together for years, like The Who. It just sounds miserable. Maybe I am differently motivated than some. Clapton the most critically acclaimed guitarist in the world? You mention Hendrix later. He'd get my vote before Clapton. It's a great debate: Clapton vs. Hendrix. I do think Hendrix was/is the most innovative rock guitarist. (Rolling Stone Mag agrees, for what it's worth. I think Clapton does too.) But in spring 1968 Clapton was God. And he got BETTER post-Cream. And Jimi was a perpetually happy dude.